The House of Wolves has been revealed with a new prologue trailer. Seen it? Join us for a walking tour of the Vestian Outpost. Meet the vendors with whom you’ll trade bravery for treasure. Learn about their motivations and objectives. Creative Director Christopher Barrett will be your guide. Special community guest Gothalion will ask the questions about what the next expansion to Destiny means for all of us. It’s been a busy week for Destiny news, so this update was admittedly light. We’re hard at work planning the events that will bring you into the sweet, purple glow of The Reef. Please don’t worry about being starved for details. 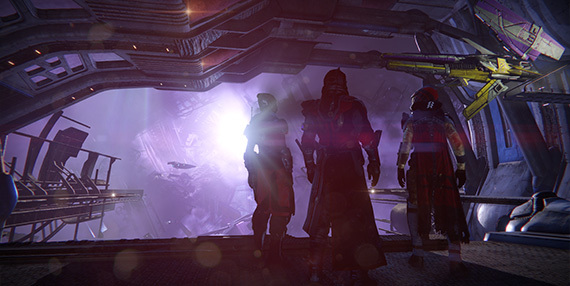 Week over week, we’ll serving up delicious chiclets of information about the House of Wolves. In Update 1.1.2, Bungie has added new audio controls that can be found under the Settings tab. These controls have some settings worth noting. You can read up on these settings in our 1.1.2 Audio Guide. We recently updated the Microsoft authentication path for Bungie.net to require an associated Xbox Live Gamertag via www.xbox.com. This change in authentication will help enable Xbox One friends to be visible on web and the Companion App. It goes live on Monday.